This 2-Post Open Frame Rack is an ideal solution for mounting networking and telecom equipment in a wide variety of IT applications from small wiring closets to colocation datacenters. This rack is designed for standard 19in equipment, has a 3in channel, and supports up to 750lbs. The computer guided manufacturing makes this rack self squaring and self supporting. 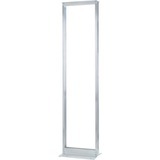 Additionally, this rack features a standard EIA hole pattern front and back and it meets EIA-310 Standard.